In 2010, Richard Hetzler, the founding executive chef, shared some of the restaurant’s recipes in a cookbook that was equally well received, The Mitsitam Cafe Cookbook (Smithsonian, Washington, D.C., and New York, 2014, in association with Fulcrum Publishing, Golden, Colorado). The book’s beautiful design was evident before I even opened it. I always remove dustjackets from any cookbook I take into the kitchen to keep them clean. Normally all that is underneath is a plain cover, but the Mitsitam designers added cover art, a nice touch overlooked by many publishers. This great design continues throughout the book, with pictures of artifacts in the NMAI collection and archival photography for each recipe. It was the winner of the “Best in the World” cookbook award from Gourmand International. The book opens with an introduction by Nicolasa Sandoval, a member of the Chumash (the Native American people who historically inhabited the central and southern coastal regions of California), discussing the importance of food in Native American society. She praises Chef Hetzler’s mix of traditional dishes and original café offerings. Like the café, the cookbook features cuisine from five areas of Native American Culture: Northeast Woodlands and Great Lakes; South America; North Pacific Coast and Columbia Plateau; Mesoamerica; and Great Plains. Unfortunately like the café, it overlooks the tribes from the Southeast United States. The cookbook organizes the recipes around traditional cookbook chapters (appetizers, soups, salads, etc.). It also includes a chapter on Basic Recipes and Techniques with helpful staple recipes and an index of recipes by region. 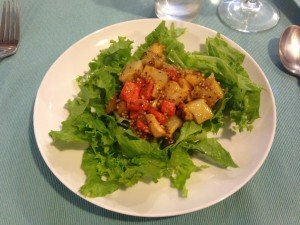 To make a dinner menu for guests, I selected five dishes. I started with the Peanut Soup, followed by the Root Vegetables with Mustard Seed Vinaigrette served on greens. The main course was Salmon Cakes surrounded by the Celery Root Salad. And for dessert, Maple Popcorn Balls. 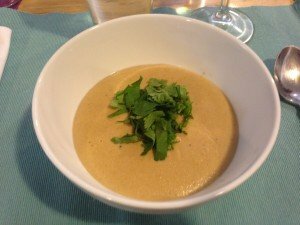 As a recent transplant to Washington, D.C., I decided to pay homage to Virginia peanuts with the Peanut Soup, though I learned from a sidebar that while peanuts are native to South America, they arrived in the United States from West Africa. The recipe is easy to assemble and yielded a smooth delicious, soup. The only complaint from some of the guests was that it was a bit spicy. For a salad course, I chose the recipe for Root Vegetables with Mustard Seed Vinaigrette, which I served on greens. Hetzler attributes this dish to the Pacific Northwest and Columbia Plateau, though the techniques are French. Cooks looking for a collection of historical recipes may be disappointed, as all the recipes are from an award-winning café and would be unfamiliar to members of the Chinookan or Tlingit tribes. For the main course I combined the Celery Root Salad with the Salmon Cakes. While only a few key ingredients are indigenous to the Northwest, the recipes were delicious! The salad could easily be mistaken for a slaw and the mayonnaise-based dressing was the perfect accompaniment for the salmon cakes. 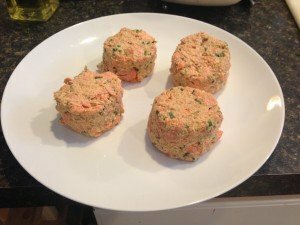 The salmon cakes were bright and had a much better texture than those made with canned salmon (the common ingredient often used by home cooks). As a chef’s note, these could be made with raw salmon as opposed to cooking the salmon first. It would allow the cakes to develop more of a crust and then could be finished in the oven to cook through. 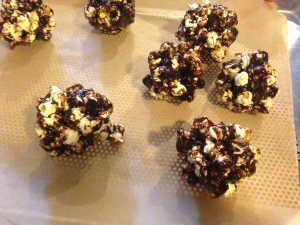 The Maple Popcorn Balls (our dessert) were the best representation of indigenous ingredients, although the recipe’s simple cooking method left something to be desired. The instructions ask the cook to heat the maple syrup over a medium heat until a candy thermometer registers 290F, an oversimplification of a tricky process. Syrup on the stove tends to hover around 230F before taking off. It also foams significantly, which can be reduced by adding a bit of butter, a well-known trick that isn’t mentioned in the cookbook. These are key pieces of information to guide a first-timer to success. As with any cookbook, the best way to read a recipe is as a guide. Counter to my usual practice, I attempted to faithfully replicate the recipes. I found myself carefully measuring ingredients and exactingly following the method, almost to my detriment. I drew the line at adding the full amounts of the wet ingredients to the two salads, salmon cakes, and popcorn balls. Had I followed the recipes exactly, the two salads would have been swimming in the dressings, the salmon cakes would have been soggy and mushy, and the popcorn balls would have been more maple than popcorn. 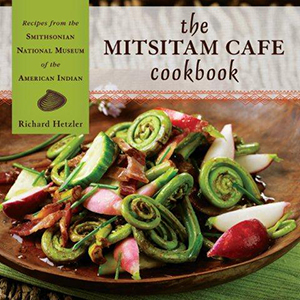 Like its’ host museum, The Mitsitam Café Cookbook shines in the stories it tells about Native American histories and cultures. The beautiful photography and background information provided enrich the experience of the food. Cooks who use this book as an inspiration rather than a rule book will find it delicious and fascinating.